DEADLINES: The Contest entry period begins at 6:00 PM local time on April 5, 2019, and ends at 11:59 PM local time on April 10, 2019 (“Entry Period”). The sole determinant of time for purposes of entries will be Sponsor’s server machine located in the EASTERN time zone. https://gvc.typeform.com/to/qV1zMs and completing the entry form. “Contestants” choose one golfer from each of three pre-determined tiers (Contestants choose three golfers in total) The prize money those three selected golfers earn collectively during the major golf tournament that is played from April 11 through April 14, 2019 in Augusta, GA (“the Major”) will be accumulated for each contestant (“Group Earnings”). Additionally, each Contestant will be asked to predict the lowest amateur golfer (in relation to par) in the Major (“the Low Amateur Prediction”). Contest winners are based on the Contestants whose selected group of three golfers has accumulated the most Group Earnings during the Major. If there is a tie for any or all of the prizes, the tie-breaker will be determined by the Contestant’s Low Amateur Prediction. If the tie-breaker process does not result in a clear winner for any or all prizes, winners will be chosen by random drawing by all prize-eligible entries. All complete eligible entries will be entered in the Contest. One entry per person AND/OR email address. Duplicate entries will be disqualified. All entries must be received during the Entry Period. HOW TO WIN: Winners will be selected from a pool of all Contestants. The Group Earnings will be tabulated after conclusion of the Major. In the event of a random drawing, the drawing will be conducted between April 15, 2019 andApril 17, 2019. Group Earnings tabulations and random drawings will be conducted at the Global Value Commerce, Inc. offices in Raleigh, NC. Global Value Commerce, Inc. or GlobalGolf.com decisions shall be final. CONDUCT; NO INTERFERENCE WITH OPERATION OF CONTEST: By entering the Contest, you agree to be bound by these Official Rules. 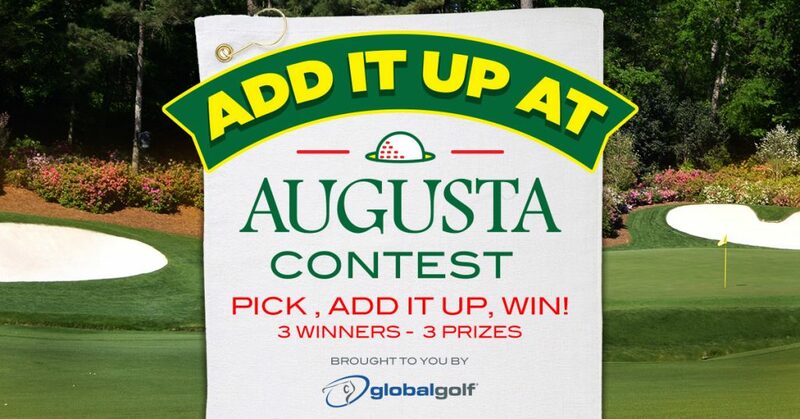 The Official Rules are posted at [http://blog.globalgolf.com/2019/03/add-it-up-at-augusta-contest/ ] throughout the Contest. You further agree to be bound by the decisions of the Sponsor, which shall be final and binding in all respects. You are responsible for complying with all applicable federal, state, and local laws and regulations and with these Official Rules, and by entering, you agree to be bound to these Official Rules.